This is a brightly colorful digital flower download I created from a flower pot illustration I discovered on a vintage greeting card. The pink and blue Daisy flowers in the terra cotta pots are absolutely gorgeous. 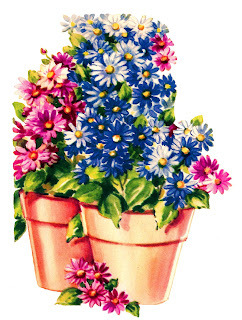 This digital image of potted Daisy flowers is perfect for any spring project! 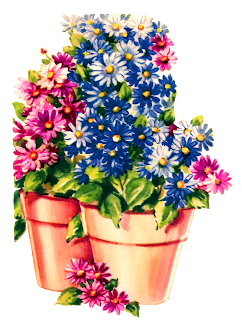 I love sending out spring greeting cards, and this digital flower pot clip art has been featured on some of my handmade greeting cards.